Dr Jing Han is a Chief Subtitler at SBS TV, Australia’s extraordinary multilingual and multicultural public broadcasting service. Her paper on cross-lingual & cross-cultural communication in subtitling at the recent AUSIT Conference made us all reflect on how we facilitate the transfer of meaning between cultures. For me, one of the most interesting aspects of this talk was Han’s discussion of the meaning of meaning, which included an outline of the various approaches to this conundrum. For example, Charles Kay Ogden and Ivor Armstrong Richards (1960) believed that there was only one true and original meaning behind a text. Many monolinguals seem to believe this is the case, as indeed do some people working in the translation industry. A follow-on from this is that multiple translations and back-translations should always produce exactly the same text, every time. This is patently untrue, as in reality, it is the indeterminate nature of meaning which results in various translated versions of one text. Decoding this area of indeterminacy requires the application of intellect, knowledge and creativity, and while machine translation certainly has its uses, it is nowhere close to achieving this level of understanding when faced with complex or sophisticated levels of meaning. “Translation is a process that involves looking for similarities between language and culture – particularly similar messages and formal techniques – but it does this because it is constantly confronting dissimilarities. It can never and should never aim to remove these dissimilarities entirely. A translated text should be the site at which a different culture emerges, where a reader gets a glimpse of a cultural other, and resistancy. A translation strategy based on an aesthetic of discontinuity can best preserve that difference, that otherness, by reminding the reader of the gains and losses in the translation process and the unbridgeable gaps between cultures”. (Venuti 1995: 305). The Translator’s Invisibility: A History of Translation. Lawrence Venuti. Routledge: Oxon, New York. 1995. This quote was interesting to me because this point of tension or “resistancy” between languages is something I find myself negotiating on a regular basis. Then, of course, there’s Umberto Eco‘s approach to meaning. He sees the transfer of meaning as a process of negotiation: in order to get something, a translator has to decide to renounce something else as it is not possible to have everything (I wonder if this is the opportunity cost of translation?). Eco’s approach in particular reminded me of the role of decision-making in translation. The German translation researcher Wolfram Wilss (1998) wrote a fascinating entry on this for the Routledge Encyclopedia of Translation Studies (pgs. 57 – 62). Communication isn’t a given, translators have to make it happen. Dr. Han also explained how an essential feature of human communication (verbal and non-verbal) is both the expression and recognition of intention. We are able to recognise intention and therefore meaning through context, which provides a kind of cognitive environment in which to decode communication. But not everyone in a given group will have the same cognitive environment. This explains why, for example, a child may understand the literal meaning of a joke but only adults may find it funny, as they alone have sufficient context to understand its implicit reference to adult themes. So when it comes to translation, the question arises: who is responsible for providing this cognitive environment, given there is rarely a precise alignment between cultures? Translation researcher Ernst-August Gutt (1991) questions whether translators can be truly neutral, given they are often required to provide context that may not be there in the original in order to address a specific target language audience. How to encompass all this in subtitling? Of course it’s not always possible to contain the full sense of meaning in a subtitle, especially given the contraints of the medium, e.g. the subtitler is translating speech into a reading format, which requires a slower processing time for the audience, plus other time and space constraints, etc. Therefore the subtitler needs to aim for optimal relevance in minimal time. 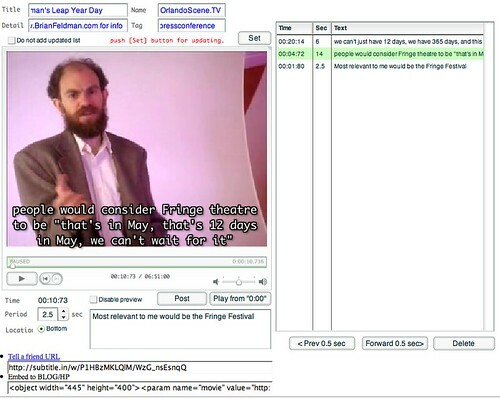 The unique nature of the transparency of subtitling can contribute to achieving this optimal relevance. For example, communication clues included in oncreen visuals, body language, tone, etc. can all help the subtitler offset the inevitable degree of meaning loss. Han also spoke about tackling the old chestnut of offensive language, and provided some interesting examples she had come across in the course of her work. Finally, she explained a little of the background of subtitlers working in SBS, including typical career pathways, which was an interesting insight for translators of all experience levels. This was a fascinating session which provided many practical, real-life examples of an aspect of translation I am regularly exposed to, but have never personally practised. OGDEN C. K. & RICHARDS I. A. The Meaning of Meaning. A Study of the Influence of Language upon Thought and of the Science of Symbolism. Routledge & Kegan Paul: London 1960 [first edition 1923]. RUBEL, P.G. & ROSMAN, A. [eds]. Translating Cultures. Perspectives on Translation and Anthropology. Berg: Oxford, New York 1995. VENUTI, L. The Translator’s Invisibility: A History of Translation. Routledge: Oxon, New York 1995. ECO, U. Mouse or Rat: Translation as Negotiation. Weidenfield and Nicolson: London 2003. WILSS, W. Decision making in translation, in BAKER, M. & MALMKJAER, K. [eds]. Routledge Encyclopedia of Translation Studies. Routledge: 1998. pp. 57 – 62. GUTT, E. A. Translation and Relevance: Cognition and Context. London: Blackwell, 1991. Photo credit: Add subtitles to video podcasts, from Liberatr.net’s photostream on Flickr. Great article, as usual, Sarah. Jing’s paper really was extremely interesting. The ‘positively abusive’ approach to subtitling is probably the most comprehensive one can have, and Nornes’ essay is very enlightening, but I think Jing found the right expression when she talked about a ‘cultural filter’ that subtitlers need to use, in order to be able to see the source text with the eyes of the target language audience. I found that particularly fascinating because, as it often happens in translation, it’s another one of those concepts (like style, flow, ear…) that are hard to measure and quantify, and make it hard for us to explain what we do in a few words. Understanding and comprehending while inturpreting. I think Nornes is missing here. Check his ‘For an Abusive subtitling’ article, (2004). You should find it in Venuti’s Translation Studies Reader. He basically says that not only it is not always possible to contain the full sense of meaning in a subtitle, but it is simply impossible and subtitlers who aim for that produce what he calls ‘corrupted’ subtitles. Because this is pointless and unethical, he calls for ‘positively abusive’ subtitling. Good post though! Subtitling is fascinating! ‘Positively abusive” – I like it! Thanks Pierre.